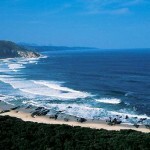 Welcome to Tsitsikamma, an area the ancient Khoi San people called “the place of abundant water”. 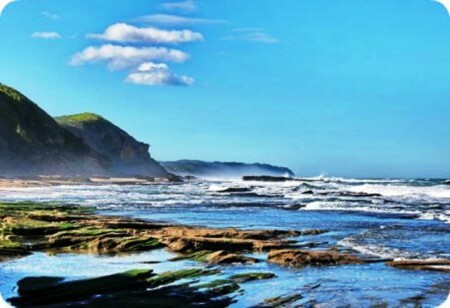 This coastal reserve, a protected area, is well known for its pristine indigenous forests, dramatic coastline, and the Otter Trail. 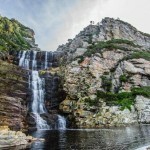 Tsitsikamma stretches from the Bloukrans River in the west to Eerste Rivier in the east, bordered by the imposing Tsitsikamma Mountains on the north and the Indian Ocean in the south. This region overflows with forests bearing ancient trees like yellowwood, hard pear, stinkwood and ironwood; fynbos covered landscape and the appearance of entrancing animals and birds, including the shy Knysna Loerie. Deep river gorges cleft the plateau as they make their way down to the sea, creating spectacular waterfalls and deep kloofs. Not only does Tsitsikamma National Park conserve indigenous flora and fauna, it also protects the marine life, with a marine belt stretching 5.5km into the ocean. Natures Valley (30km from Plettenberg Bay), a little bay boasting untouched indigenous trees, forest and beautiful unspoilt coastline preserved since the first inhabitants of early times, is the only town within a national park. 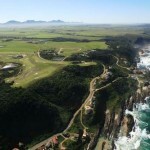 This is where the world renowned Otter and Tsitsikamma Mountain trails starts. Storms River lies at the feet of the Outeniqua and Tsitsikamma mountains and offers prolific birdlife, vast expanses of Cape flora, delicate eco-systems in wetlands and lagoons, gigantic trees and adrenaline pumping activities. 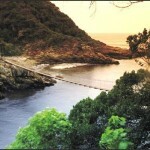 The famous Storms River Suspension Bridge spans the river mouth. 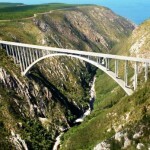 The nearby Bloukrans Bridge offers the world’s highest bungee jump at 216 meters – go on, take flight! 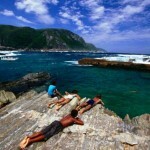 Tsitsikamma is geared for visitors who prefer simple accommodation, unspoiled nature and active holidays. Storms River Village. Known as the Adventure Capital of South Africa thanks to the number of great adventure-type activities operated from or within close proximity to this peaceful village. 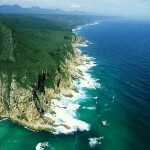 Storms River Mouth, a section of the Tsitsikamma National Park, is very scenic and a must-visit. A number of short trails (2-6km) allow you to explore the coastal bush and rocky shoreline. The most popular walk takes you to the river mouth with the well-known pedestrian suspension bridge that spans it. Other facilities include a restaurant and dining deck with fantastic ocean views, a tidal pool and a small curio & convenience store. The Otter Trail. Undoubtedly the best known and most popular of the South African hiking trails, rank alongside the best in the world! It spans the spectacular coastline from Storms River Mouth to Natures Valley, in the Tsitsikamma National Park, following rugged, rocky shoreline ranging in elevation from sea level to a height of more than 150m. Most of the trail follows cliff tops returning to sea level to cross rivers.. The trail is 42,5kms long and takes 4 1/2 days to complete. The Big Tree in the Tsitsikamma forest stretches its distinctive Yellowwood leaves skywards, towering over all the other trees in the canopy. This, the “Mother of our indigenous forest” is the oldest of the Tsitsikamma yellowwoods with an age of between estimated 600 – 800 year. It stands 36,6 meters tall and has a trunk circumference of 9 m. Well worth a special visit! 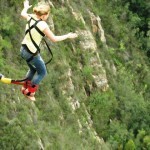 Bloukrans Bridge Bungy. Itself an engineering marvel, this bridge holds another claim to fame –the highest commercial bridge-based bungy jump in the world! Bloukrans attractis adventure seekers from all over the globe – at 216 meters (almost 70 storeys); it is definitely not for the faint hearted. The Paul Sauer Bridge (1954) spans the impressive Storms River Gorge. Erroneously known to many as the Storms River Bridge, this marvel of architecture and engineering was designed by an Italian Riccardo Morandi. Hiking Trails. Tsitsikamma is world-renown for their abundance in hiking trails, including the extremely popular Otter Trail (need to book atleast a year in advance to guarantee space!) & the Dolphin Trail. 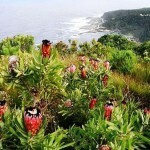 The Bloubaai and Elands River trails are popular 1 day Coastal hikes. Otter Trail – If you’re not up for the full trail, enjoy the first 4km leading to a waterfall. Alternatively, hike the third day, lilo up the river, snorkel in a tidal pool and have a picnic in the forest. Escape the heat and crowds of the beaches on a 1km round trip forest boardwalk path leading to Tsitsikamma’s The Big Tree. Catch a glimpse of the majesty that once ruled the forests! 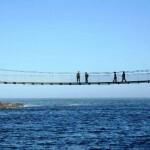 Photos at Storms River Mouth’s well-known pedestrian suspension bridge. 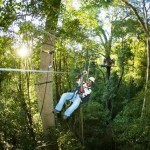 Treetop Canopy Tours – a unique eco-wilderness adventure in the magnificent Tsitsikamma indigenous rainforest. Traverse from one platform to another along a steel cable suspended up to 30 meters above the forest floor. Many of the platforms are built around giant Outeniqua Yellowwood trees that are up to 700 years old! There are 10 platforms and 10 ‘fufi’ slides, the longest of which is 100m! 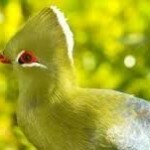 The scenery and bird life is spectacular and professional guides provide interesting facts about the forest ecology. A 2½ – 3 hour activity. Tsitsikamma’s Woodcutters Journey. Journey down the old Stormsriver Pass, experiencing the indigenous forest from the comfort of a specially-designed vehicle. Follow the elephant trail, pass yellowwoods and stinkwoods, hear about the history of the area, flora and fauna. Enjoy a delicious lunch or tea at a beautiful picnic site next to the Stormsriver, where wagons outspanned more than a century ago! 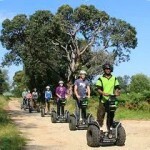 Segway Tours through the local township, exploring the indigenous forest and a pit stop at The Big Tree. 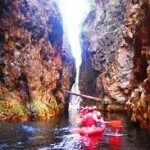 Truly discover Storms River Mouth, underwater and up the gorge. Guided Scuba & Boat Diving, Courses & Gear Hire, Snorkelling Trips and the unique Kayak & Kloof Adventure. 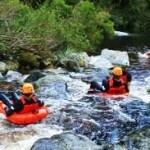 Blackwater Tubing in Storms River. A unique, fun filled adventure combining swimming, tubing, nature walks, bird watching, rock jumping and more. The Khoisan Village, found nearby the Bloukrans Bridge, offering insights into the lives of the native peoples of this area, as well as opportunities to buy local arts and crafts. Round of Golf at The Fynbos Golf & Country Estate. Perched against the backdrop of the majestic Tsitsikamma Mountains, the estate boasts spectacular views over rocky inlets, coves and sea-side cliffs. 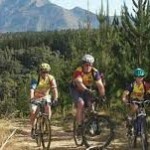 Mountain Biking with a choice of either a 10km trail at the foot of the Storms River Peak, alternatively a 22km trail through the Old Storms River Pass to the viewpoint of the Tsitsikamma National park and back. 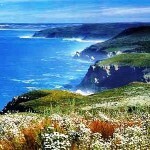 Click here for all listed accommodation in Tsitsikamma and the nearby vicinity.